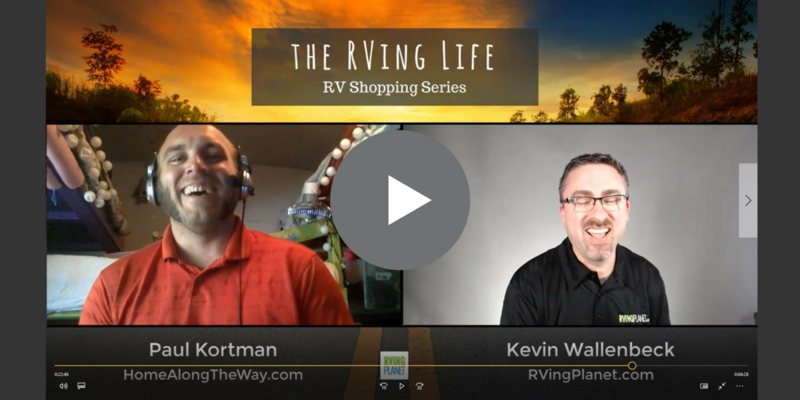 Welcome to the fifth episode of “The RVing Life Show”, where I interview Paul Kortman of Home Along The Way where he and his family share their experiences from their location independent family full time travels. Paul is a down to earth, ‘been there done that’ guest. Awesome insights into buying an RV for traveling with a young family. How time and organization are critical to successfully buying the right RV. Great overall insight from a well traveled RVer. 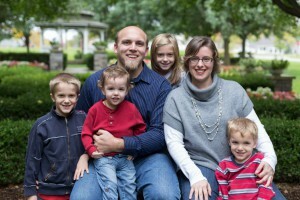 http://homealongtheway.com – Keep up with Paul and his families adventures. http://nomadtogether.com – Paul’s podcast aimed at helping families live with location independence. Road Ready Checklist – Leave your driveway with confidence! Search for your next RV by weight, length, floorplan style, and much more! Kevin: Welcome, everyone to this episode of the RVing Life. So happy to have everybody here listening in and watching today, and we have Paul Kortman with us. Paul, welcome to the show. Paul: Hey, glad to be here. Thanks for having me. Kevin: Yes, fantastic. We’ve had some much technical difficulties getting started here and we could do a whole show on WiFi at campgrounds. And I’m sure we’ll be one at some point, right? Paul: Oh, yeah. That’s a bad story. Kevin: I would … I hope they’re getting better, but anyway we’ve had some challenges and we’re trying to get rolling here. So Paul, again welcome to the show. Just give us a quick update on you, how long have you been an RVer and tell us a little bit about your family and what you guys are doing. Paul: Sweet. So my wife, Becky and I have four kids, they’re ages 4 to 11. So kind of the perfect age for this lifestyle, we’re full timing in a class A, a 37-foot class A, and we’ve been in Mexico for the last 18 months, and we’re over in the Yucatan Peninsula. So if you’ve heard of Cancun, Playa del Carmen, that sort of thing, that’s where we’re at. We’re just inland, we moved back inland today. So yeah, we’re enjoying the heat and humidity down here. Kevin: Nice. I’ve been to Playa del Carmen but it’s been on a cruise ship. Paul: Yeah, it’s gorgeous there. But it’s even more fun in the campground because you’re right on the beach and so the kids are playing in the sand right outside the door. It’s fantastic. Kevin: Very cool. Did you get any pictures of that? Paul: I did. I don’t know if any of them are good enough for the lifestyle though. They’re just kind of more like a shot of our kid playing in the sand, so I’ll see what I’ve got that I can share with you. Kevin: That’d be cool. We’ll mention at the end of the show as well, we’ll talk a little bit about as we get going, but some websites that our folks can get a hold of you and see what your family’s up to in the close at the end, but maybe you have some stuff to post up there. But cool, man. Welcome to the show again. And how long have you guys been RVing? Have you been in months, full timing, is that been there, or do you do it before or? Paul: Well, actually we’ve been two years full timing. We spent six months in the States before we got into Mexico. As they say breaking it in or replacing a transmission in our motor home to be real. But before that we had a little pop-up, so we’ve been RVing for I don’t know probably eight years or more just since our daughter was three and, yeah, been having a lot of fun. It’s a drastic difference going from a pop-up to a motor home and a drastic difference from going out for Memorial Day weekend to oh, my goodness we live in this full time and there’s no break from this. So it’s fun. Kevin: You guys have had quite the experience. I mean, that’s quite again most people don’t have that, right? Kevin: Our first RV was an expandable, so it was hard sides, right? For those of you that maybe even new to RVing, hard sides are typically like the box, right, with four walls. And then there’s the pop-ups. Everybody knows what they are, they kind of crank up and then the tent ends. An expandable or a hybrid is actually four walls, so it’s a box, but then the ends just kind of tip out. And that was our first RV, and then there was a couple times, you mentioned the bugs, we pull in late, 7:30, 8:30 and trying to set up camp and oh, my goodness, the bugs are just terrible. And so I totally get that, man. But we have hard sides now as well all the way around. So it’s a bonus. That’s awesome, man. The whole RVing lifestyle for your guys, we’re going to get into some shopping questions and kind of how you guys picked your RV and all that in just a minute. But just so people have some background on you, RVing full time is only a piece of the puzzle for how you guys have chosen to live as a family, was that right? Paul: Yeah, so we kind of fell into this lifestyle, it’s called the location independent lifestyle. And there’s a bunch of families out there doing it, some counts are anywhere between 10 and 20,000. You may be familiar with in the US there’s like full time families and such like that, like there’s a lot of groups of full time RVers or location independent families. But what you didn’t realize is that RVing is just one way to do it. You could live aboard a sailboat, you could fly around the world and stay in Airbnb’s, you can drive in a car and stay in Airbnb’s, and then there’s a lot of overlanders that we end up camping with here in Mexico. And overlanding is a completely different topic. And if you’re looking at RVs and you’re looking at full timing I would encourage you to look for overlander vehicles and just see what the difference is, because it really opens your eyes to you can literally live in a vehicle anywhere. And that’s what we’re doing. We’re making our RV to be our overlanding vehicle and there’s some differences there. But we were homeschooling our kids and my business that I run was location independent, I hadn’t met half of my clients, and then we decided to fly around the world, and then when we got back to the States we ended up buying this rig, and well, parts of this rig, we’ve added to it and reconfigured as went. And then we were originally going to drive down to Ecuador with this rig. We’ve decided, we’ve fallen in love with Mexico, and we call her Gracie, every rig has to have its name. And Gracie has gotten a little age to her. She’s showing some signs of being 20 years old and I had the ship ahead so a part of an engine, the engine head, I had to shift that from the States because it’s not available here. And doing that once tells me that maybe I don’t want to go further south where the shipping is more expensive and parts are fewer and further between. So we’re going to find a place to put her up on block somewhere here, because it’s a great house, we love to live in her. So we’re going to live in her probably six months out of the year and then who knows maybe get an overlander vehicle, maybe just fly somewhere and enjoy it for six months out of the other six months. Kevin: Wow, just like most of our guests we’ve had on the shows already what you just said in about two minutes has about 40 different things to talked about in it. Kevin: And maybe in the near future we can get you back on and talk about some of those things. But it’s brought to jump into our primary segment of our show which is kind of talk about the RV shopping experience, and again our show today is sponsored by, I have their shirt on today, RVingPlanet.com, so make sure you guys check out RVingPlanet.com and there will be some more resources down below to help you guys on your shopping journey as well. So as you got … I know you guys bought used, and chose used, and so you’re going to talk from that experience. But a lot of things you’re going to say today are applied to new buyers as well I’m sure. So as you guys were thinking about buying your RV, how did you make the decisions of what was right for you, how long did that take, and well, tell us the process you guys work through to find out what was right for you and your wife and your children and all that. Paul: Well, it’s kind of funny. Our children were young at the time when we bought it. Our oldest was nine, and so they’d loved any RV, they loved any motor home. Kevin: Like we’re going camping forever. Paul: Exactly. My wife’s parents have a fifth wheel and so we borrow that’d every now and then and the kids would sleep in there for the weekend or whatever. And so like they just, everything camping was awesome. And this is after they’ve flown around the world, they still love camping. So they’re just like, “Okay, sweet. We love it.” So they didn’t really have a whole lot of like I need to have this and I need to have this, but because we had kids my wife and I had a lot of needs about like what specifically we wanted to see in a rig. And so our process was actually like we had never gone and purchased anything as far as an RV had been concerned. The pop-up was a hand me down when my father-in-law upgraded to a fifth wheel, he handed us as pop-up. So we’re both in the business of moving from a pop-up to this monstrosity and so we were going to follow suit. But we had looked into lots of different things, we knew pretty quickly that we wanted a motor home for the flexibility of while we were driving, just enjoying the driving experience because we were going to drive a bunch. And so that narrowed the field for us quite a bit. But even in the motor home arena there’s still a ton of choices. And so we ended up going to a couple of RV shows, we kept stopping at RV dealerships and going to used RV dealerships and that sort of thing, and that was really helpful. We’re living in Michigan at the time and it was fall, winter, spring when we were doing all of this. And so it’s the worst time of the year to shop for an RV. But the next part is that in winter they do the indoor RV shows, so you can go in there and there were some indoor RV dealerships so that we could go and see it. Because they’re prepared, “Hey, guess what? It’s winter and people still want to see RVs.” So yeah, we were able to go in. And I think the best thing for us was going in and seeing how these floor plans worked and what was available. I would say one of the most frustrating things for us is like there’s no easy way to pick and choose, like I don’t even know what a technical term is, but we called it a split bathroom where you have the toilet on one side and the shower bathroom or the shower and sink on the other side. And my wife was really against that. We ended up buying one with a split bathroom. So it’s not as bad as we thought it would be. But she was just like, “That’s awful. That’s terrible.” And we’ve grown to, I don’t know love it, we’ve grown accustomed to it. But like I would love to be able to choose check boxes of like has this kind of a shower, has a non-split bathroom, has a slide out or whatever. So you can choose sliders but you can’t choose like the other certain features. Like one of them that we really look for was having a third captain’s chair. So you got the two front captain’s chairs in a motor home, you don’t always have the third. And ours has a table between the passenger seat and the third captain’s chair. And that was a feature that once we saw it we were just like, “We have to have that. That is so beneficial for our family situation.” And there’s just no easy way to find that. And so we spent countless hours looking online because then we started searching online like what was the best price range, the best layout, the best rig. And it was just, I had to pull up a spreadsheet and be like here’s the three or six or ten options that we have and do they have this, do they have that, do they have this. And so it just went down the list of like is this acceptable or not. And so I spent probably two hours every night filtering through all the online sales of eBay and whatever else there was out there. I can’t even remember them all. And then just slowly building this spreadsheet, and then every now and then Becky and I would look at it together and be like, “We’ll take this one off the list. That one’s a maybe. We’ll still watch it.” And so that’s just kind of how it went. So one of Becky’s requirements were the no split bathroom, my requirement was that we have a driver’s door. I thought that was really important which is an option in some motor homes, and then we both agreed that we needed the kitchen stove, fridge and counter space and sink all on one side, all together instead of the kitchen split, and so that when you’re taking stuff out of the fridge you have a counter or the stovetop to set stuff on. And we’re really happy with that decision. Kevin: That’s pretty cool. So people that are out there shopping right now some of what I’m picking up from what you’re saying, what you’re laying down, right, is you’ve got to take the time to really figure out, we’ve heard that from other guests as well, it’s not uncommon. 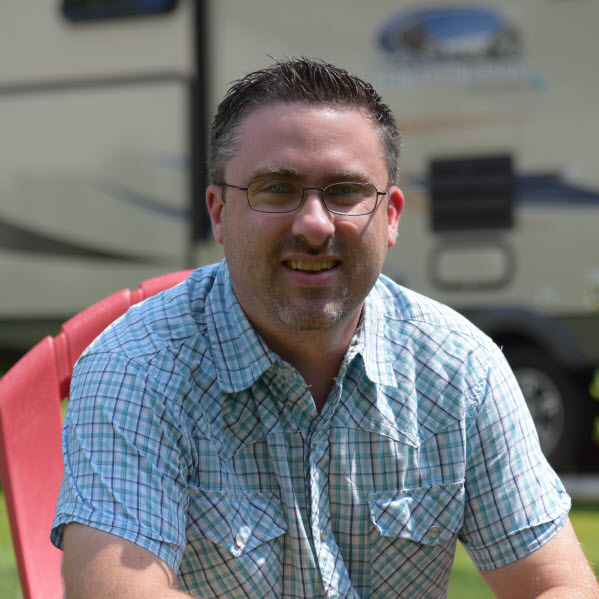 How long did it take you guys from when you kind of … everybody kind of goes through the buyer’s journey, there’s an RV buyer’s journey, there’s like six different primary steps. And there’s that first phase of curiosity, right? Curiosity to writing the check, like what was that timeframe for you guys? Paul: Faster than I would recommend. So we spent a lot of time but we’re pretty, I don’t know, we like what we see when we see it or whatever. And we did buy on eBay and so it was one of those things of where, “Whoa, the price is right and it ends in 12 hours.” And so you start bidding on it and you’re like, “Well, this is my last bid I can do.” And then it ends up winning and you’re like, “Okay, we own an RV, whoa, okay.” So like it was all this build-up, all this build-up, all this build-up and then boom now you own an RV. It’s in California, you’re living in Michigan and you have no idea how to get to it. But we … Oh, let’s see. We started I would say in December is kind of when the first thoughts came about of like, “Hey, let’s do this.” January we spent the entire month just doing voracious reading and going to the shows and the dealerships. We were at another one every weekend, and probably the same thing through February. And then we purchased this in March. So three months. Kevin: Yeah, so let’s say three months, we’re finding three months to two years. It’s like this window of how long it takes people. I mean, you guys had some goals, right? I think every family that’s out there looking to shop for an RV whether you’re just a weekend warrior, right? You’re going to be taking; you’re a weekend warrior where you’re just taking your RV, going away for the weekend, right? Or you’re that person that’s going to be living full time in your RV, it’s really important to take the time to make some notes, write some things down. I mean you said you created a spreadsheet. I know that RVing Planet, a quick plug for them, and it’s down the resources as well of the show is that they have quite a few, there’s some free checklist and some free guides, they have some the cost a little bit too. But we’re finding that as people use them that they’re super valuable and helping you stay organized especially if you’re a first time buyer or you’re just maybe you bought one and used it for a little bit and now you’re looking to upgrade and go to something more permanent, long term use. But so no matter when, no matter how much you’re going to use the RV the idea of taking the time to really make sure you’re at least … there is no perfect RV, it’s a house on wheels for goodness sakes. Kevin: I don’t know. There are ones that are better or closer to perfect than others. Paul: Well, sure. Have you heard of one that’s perfect? Kevin: I love ours. I wouldn’t buy it again, but it’s perfect for us right now. Paul: Perfect, I guess maybe I should rephrase that. So one of the things that people say about the RV industry is that most people that just go out and do no shopping whatsoever, they just kind of pick something right away, they buy it, and they drive at home and the cabinet door is loose. And they think they just … this is the worst RV ever, and just like that. It’s not even fair. I mean, it’s not even really fair to draw that. But that’s our society a lot of times and that’s their mentality. So by taking the time though like you guys have done, yes, I guess you could draw something more perfect for you versus just kind of pulling the trigger quick. But be organized, take the time, those are some things I’m picking up from you that you’re saying as you go to buy. And that’s whether you’re buying new or used. I mean, either one of those. Kevin: You want to make sure, right? Paul: And everybody that I’ve talked to it’s kind of … well and I haven’t talked to as many folks as you have, but the folks that I have talked to that are looking for something specific. When you have in mind what it is that you want, sometimes it can take a long time. And that’s true whether you’re buying a stick and brick or a home on wheels. It can take a really long time. Even if it’s brand new to get the right floor plan, the right price, the right situation all put together and if you’re buying used it’s even more difficult because depending on how much of the things you want are hard to come by it can get quite complicated. So yeah, like it definitely, if you have in mind what it is you want you will be able to find it, you just have to have the patience to find it. And I would not compromise as much as possible, give it the time it takes to find the right one. Kevin: That’s very, very wise, don’t compliment. Something you said though is you guys got lucky, I mean you could say that, right? But one of my definitions of success in any area of life is being prepared for being in the right moment at the right time. Paul: Yeah, that’s really what it was is that we were, we knew what we wanted, we knew all the value of everything, and we knew the floor plan. And so we had done all of our research, so when it was available we were confident that is the right one for us. Kevin: Cool. Now kind of switching gears a little bit. We’re going to be finishing up here real quick. But you mentioned obviously you guys are in a motor home, and one of the questions I was going to ask you is how do you guys stay organized kind of while packing up and moving with four younger children? Now whether you’re RVing full time or whether you’re just going for a weekend or going for a week or two and picking up and moving, a lot of people especially motor homes will take longer cross-country trips and that’s whether you own one or whether you’re renting one, right? They’ll go to national parks and do some of that. How have you found … you’ve owned a pop-up, there’s a huge difference between set up and tearing down on a motor home and pop-up. Kevin: But to deal with four kids, how do you get packed up? How much time does it take? Just kind of give the people listening some insight into that? Paul: Well, most families in our situation end up going with a fifth wheel, because of the versatility and you have your driving vehicle, etcetera. If your home breaks down you don’t have to go in the shop and all this. There’s negatives on both sides, right, of motor home versus fifth wheel. However the positive on a motor home with hydraulic jacks is it takes us less than an hour to pack up. Yeah, we have four kids and you’d think, “Oh, we crack the whip and make them do all this work.” And it’s like no, seriously we have a bag outside that we pitch all their toys in and we shove it in the basement, and we put all … Well, we do have a bunch of snorkeling and ocean gear. So we shove all that in the basement with it and then we just kind of, we put the awning down, put a couple of things away, pulled the slider in and we’re good to go. So the jacks, the leveling system, like it’s still a manual leveling system but it’s hydraulics. That saves a ton of a time. I can’t tell you, watching people crank and get level and all this and I’m just like, “Push the button. I’m good. Thanks. See you later.” And so like, yeah, I love it. And we only have one slider so it’s a super slide, so it’s like, what? 12 feet long or something, but it’s only one slider we have to push in. And that saves a ton of time. So really all we do is we just push everything off counters that would tip over or fall down, all the kids’ toys are spread out in the floor in the bedroom. This is the bedroom that I’m coming from. We modified it, so the bed that we sleep on is on the floor and it’s a futon mattress that folds up. So we fold it up during the day and the kids have the floor space and then they have their bunk beds up on the shoulders right here. That’s one bunk, one bunk, and then there are two bunks behind me. And so we’ve totally modified and created it the way it works for us. But that means that we don’t have to pick up toys to move. We fold our bed away in the morning when we get out of bed and the kids can leave their toys wherever they want to because it’s in the back. It doesn’t matter. And we just drive on. And so they can play toys while we’re driving because … well, we won’t get into seatbelt laws, I know you’re supposed to have your kids seat-belted. Mexico is a different place, so sorry. I shouldn’t have said that. Strike that from the record. Kevin: Well, I doubt we’re going to edit it out. Fantastic. So there was a couple words that you had just mentioned that I just want to touch on real quick. If you’re not familiar with RVing, you’re new like basements in an RV, tows and things like that, go to RVing Planet, I have an RVing one on one section and you can learn some more there about just the different wording and language that RVers use so you’re not like go to a dealership and they’re talking about stuff or trying to buy one from individually and like, “I have no idea what they’re saying.” So check that out, RVing 101. So alright. Paul, we got to finish up here real quick, man. But I’m going to give you the last word and the question is any final advice for parents that are shopping for an RV and want an RV with their kids, like give us 30 seconds or less. Paul: Well, I mentioned it before, the hydraulic jacks. Like I know you can modify fifth wheels and get hydraulic jacks and all that, that is a life saver because the most stressful time of packing up with kids and getting into a campground, it’s the hooking and unhooking, is by far the most stressful time, because the kids are hot and tired and hungry and you’re hot and tired and hungry and you have to get all this put together. And so any five minutes that you can save on hook up and tear down and getting ready to go or what not is a lifesaver. So that’s why I’m a fan of a motor home because I don’t have to hook the kingpin in and make sure all the things are locked on a fifth wheel, whereas and then also the hydraulic jack, so any sort of things that you can upgrade that just make it easier to pack up or tear down worth its weight in gold. So like, yeah, like an automatic awning, worth it. Those sorts of things because it’s just going to save five minutes every time you pack up and tear down, but guess what? That is the most stressful time. Paul: This is all your fault. You always back me into a tree. Come on. Kevin: It’s always an event when people pull into a campground. And if people actually, I mentioned this before, people get their chairs out just to watch it, just to watch this going on. Paul: We totally do it. We shouldn’t, but we do it. Kevin: I know. Handheld radios are what you’re talking about, right? Kevin: Yeah, okay, very cool. Paul: They’re like, what, 25 bucks at Amazon or Walmart or whatever and they’re worth it, because again the most stressful time is getting your backend, getting loaded or if you’re in a pinch and you’re trying to get around the corner, just hand them out to your spouse and say, “Hey, can you help me out?” And they go out and just be your eyes and, ugh, man, I have hit thousands of things and every time I hit something it’s because my wife wasn’t outside with a radio. Kevin: Nobody was spotting for you. So no, I hear you. Kevin: It’s just too stressful, the hook, the tearing down, the setting up, because you want to get on the road or you want to be there. I mean, when you get there you just want to be there. Kevin: So I get that. Great advice. Thank you so much, Paul, for being on the show, man. This is great stuff. Hope to have you on the future. To our listeners, you want to check out the resources, the bottom of the show notes here at the bottom of the video, or if you’re listening via podcast you can head over to RVingPlanet.com and find the show there as well. If you have a question you’d like to have answered about RV shopping process or just the experience of buying an RV, make sure you head to the bottom of this post and there’s an answer there, so submit a question we’ll be sure to get that in to our future shows. So thank everyone for listening. Thanks again, Paul. Tell your wife we said hi, the kids. Kevin: And that wraps it up. That wraps it up for the show. Until next time, everybody. Enjoy the RVing life. Paul: Thanks. See you later. Paul loves adventure and is in charge of this crew. He also steers a digital marketing agency with efficiency and finesse. Basically, he’s just a cool guy! The families adventures are updated on their blog, Home Along The Way, where they share their experiences from their location independent family full time travels. He is also runs Nomad Together, a podcast, containing location independent families sharing what it takes to be a nomad together.